Regional markets were in the red (NIKKEI: -10.5%; Taiwan: -3.5%; HSI: -2.9%; STI:-2.8%) as Japan’s nuclear crisis deepened and worries escalated over the human and economic toll of last week’s devastating earthquake. The Nikkei index plunged 16% in two days and 25% from its 52-week high. Bursa Malaysia fell for the 4th consecutive day with the index closing at 1484.14 after recovering from an intraday low of 1476.12. The FBM KLCI fell 11.21 points today led by selling pressures among the key heavyweights following the devastating fall on the Japanese markets after earthquake and tsunami struck Japan last Friday. Also, investors reacted to the panic selling on possibility of a large-scale nuclear meltdown in Japan. Trading volume increased to 1.45 billion shares worth RM2.12 billion against Monday’s 802 million shares worth RM1.18 billion. Market breadth was negative with 126 gainers as compared to 812 losers. On top of the rising tensions in Mideast and renewed Eurozone sovereign debts issues, Japan's devastating earthquake and nuclear crisis will have investors on edge. 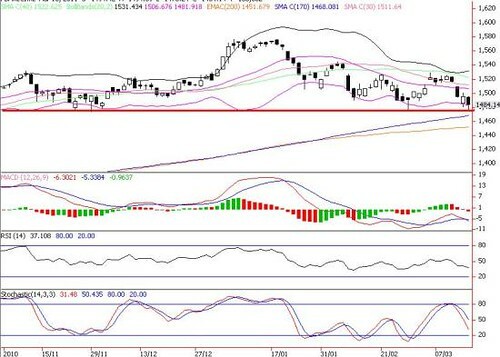 Despite the wild swings and sluggish sentiment, we can take some comfort that the local bourse is still holding up relatively well against its peers, with strong horizontal support at 1474, the twin bottoms recorded on 28 Feb 11 and 29 Nov 10. This is a critical support level which must not be violated to prevent further selldown to 1450 (38.2% FR from low of 1243 and peak of 1577) and 200-d SMA of 1441. Prior to 1474, the lower Bollinger band (now down to 1481) has provided strong support for the market over the last two days. Immediate resistance levels are situated around 1500, 1506 (mid Bollinger band) and 1511 (30-d SMA). The next targets are 1522(30-d SMA) and 1531 (upper Bollinger band). What Are The Warning Signs Of Forex Fraud? How Do The Forex Scams Work?